Affectionately called the Paris of South America, Buenos Aires has a seductive effect on travellers, many of whom grow so enamoured of the exciting, sophisticated port city that they consider making “the city of fair winds” their home. 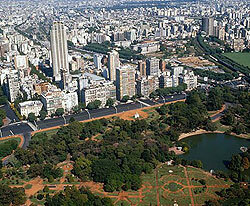 Stretching along the banks of the Rio de la Plata, the metropolis is inhabited by nearly 15 million porteños (as Buenos Aires locals proudly call themselves). It receives a constant stream of international travellers, some of which end up looking for employment in order to stay longer, drawn by the realization that they can enjoy the traditional European lifestyle without the cost of actually living in Europe. The city’s cobblestoned paths, elegantly dressed locals, grand opera houses, cozy cafés and interesting little shops, lush botanical gardens, and colourfully painted metal houses create a fusion that is opulent, dramatic, and very cosmopolitan. The streets are lined with a variety of trees, the loveliest being the spreading, flower-laden jacarandas that give shade and add color to the already-vibrant city. 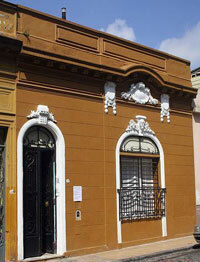 There is also a type of house here that is purely Buenos Airean: the charming casa chorizo. Designed to deal with the shortage of space in the city due to a population boom in the early 20th century, a casa chorizo is a small, narrow half-house with one door and the rooms all in a row, linked to each other like sausages (a chorizo is a type of sausage) and by a small gallery that leads from the door to the end of the house. The city‘s beginnings date back to 1536, when it was founded by Pedro de Mendoza of Spain. The port city rose to importance, and drew hordes of immigrants from all over Europe (mostly Italian and Portuguese), resulting in the multi-cultural heritage that pervades the city today. The fascinating mix of old-world architecture, modern international business, and forward-looking social attitudes (Buenos Aires has one of the most liberal attitudes towards homosexuals in Latin America) is the lifeblood of the autonomous capital of Argentina. Like any complex major city, it is divided into smaller pocket areas (called Communas, of which there are 15), each with their own particular character.